Copyright law shapes the world we live in. It is supposed to encourage progress and creativity, enriching our culture and contributing to the growth of knowledge. However, the law is often used as a blunt instrument by a few prominent actors to preserve their cultural dominance. Less obviously, governments and other large industries have taken to using the law to hide information they don’t want us to see and use or to limit functionality and ownership of software and devices we buy and use. The law shouldn’t work this way. It should serve us all. 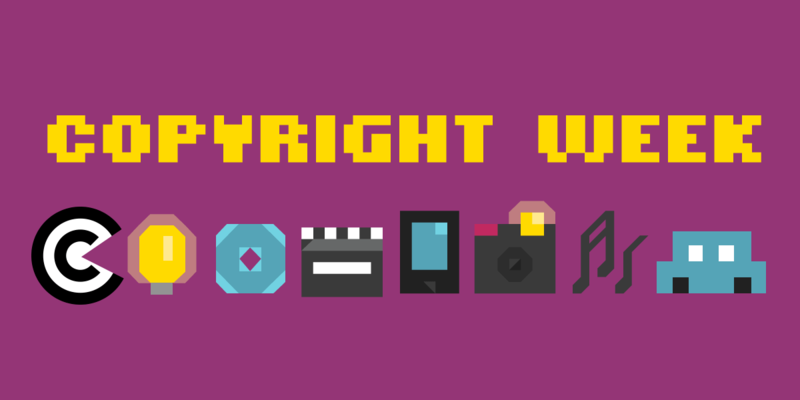 It doesn’t matter if you are a creator or simply someone who enjoys media; an inventor or someone who just wants to use, fix, or tinker with your devices; a researcher or someone who wants to look up information—copyright law impacts all of these things. And, right now, the law is out of whack. It’s balanced in favor of people who want to control things, instead of people who want to share things. Thankfully, recent years have shown that we can push back and work to fix copyright law. Six years ago this week, a diverse coalition of Internet users, non-profit groups, and Internet companies defeated the Stop Online Piracy Act (SOPA) and the PROTECT IP Act (PIPA), bills that would have forced Internet companies to blacklist and block websites accused of hosting copyright infringing content. SOPA and PIPA were laws that would have made censorship frighteningly easy and stopped the Internet from being a place where innovation and ideas can flourish. Since the battle over SOPA and PIPA, we’ve continued to identify threats and fight against them. We also continue to fight for a copyright law that does what it’s supposed to: actually encourage new innovation, art, and knowledge, not just enrich established industries. Monday: Public Domain and Creativity. Copyright policy should encourage creativity, not hamper it. Excessive copyright terms inhibit our ability to comment, criticize, and rework our common culture. Tuesday: Controlling Your Own Devices. As software-enabled devices become ubiquitous, so do onerous licensing agreements and technological restrictions. If you buy something, you should be able to truly own it – meaning you can learn how it works, repair it, remove unwanted features, or tinker with it to make it work in a new way. Wednesday: Transparency. Whether in the form of laws, international agreements, or website terms and standards, copyright policy should be made through a participatory, democratic, and transparent process. Thursday: Copyright as a Tool of Censorship. Freedom of expression is a fundamental human right essential to a functioning democracy. Copyright should encourage more speech, not act as a legal cudgel to silence it. Friday: Safe Harbors. Safe harbor protections allow online intermediaries to foster public discourse and creativity. Safe harbor status should be easy for intermediaries of all sizes to attain and maintain.